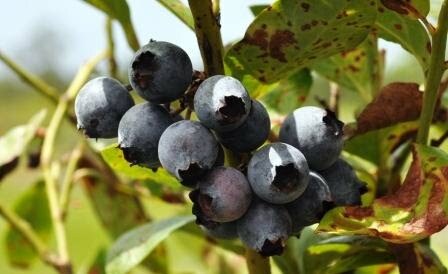 Earlier this month I picked blueberries in Fort Ogden, about 20 minutes from my Port Charlotte, Fla., apartment. I ended up gathering 2.5 pounds of the sweet berries of goodness but what to do with them? I usually make blueberry jam and I still may do so but thanks to the power of the Internet, I found a wonderful recipe for blueberry cheesecake ice cream! A friend gave me her ice cream maker and although I have no business eating ice cream, if I make it, it should be "healthier" for me, right? I found a Cooking Light recipe on MyRecipes.com and reduced it to fit the countertop ice cream maker. Unfortunately, I didn't research how a Krups ice cream maker works and the drum needs to be frozen for days, much longer than the 20 hours I had it in. Needless to say, the ice cream mixture didn't freeze in the maker but in the freezer. Still, it was delish! And no, I didn't eat it all myself, I shared. Here's my modified recipe. (Again, here's a link to the original recipe.) Enjoy! Combine sugar, cream cheese and egg yolks in a bowl and beat with a mixer on high until smooth. Combine milk and half-and-half in a saucepan and bring to a boil. Remove from heat. Add half of the hot milk mixture to cheese mixture stirring with a whisk 'til creamy. Return it all to the milk mixture on the stove, cover and cook over medium-low heat 5 minutes (or 'til thermometer registers 160 degrees) and stir constantly. Place pan in an ice-water bath. Cool completely and stir occasionally (It'll cool pretty quick). Combine blueberries, powdered sugar, and 1/4 cup water in a small saucepan and bring to boil. Reduce heat, and simmer for 10 minutes or until mixture thickens slightly, stirring frequently. (Mine took much longer than 10 minutes). Stir blueberry mixture into milk mixture. Pour mixture into the freezer can of an ice-cream freezer; freeze according to manufacturer's instructions. 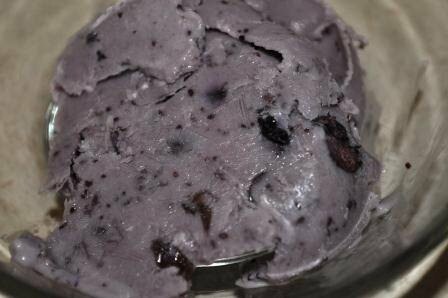 Spoon ice cream into a freezer-safe container, cover and freeze for 1 hour or until firm...if you can wait that long. You have my permission to eat out of the ice cream drum.